If you have heard the name Tannhäuser before, there’s a good chance that your source was either Richard Wagner’s opera or the fleeting reference in Blade Runner to c-beams glittering near the dark of the Tannhäuser Gate. 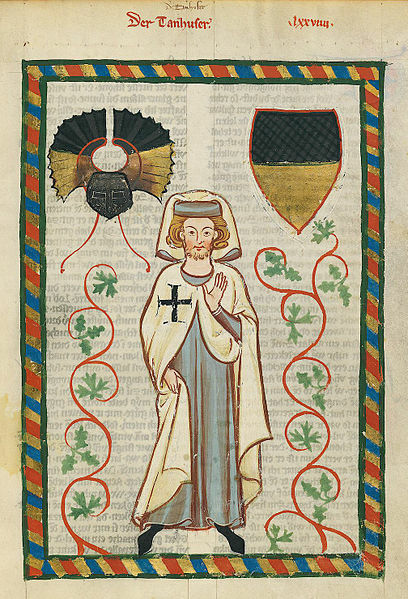 The actual Tannhäuser (d. circa 1265) was a knight and Minnesänger in the court of Friedrich II of Austria, a minor noble who shouldn’t be confused with Friedrich II Hohenstaufen, the great Holy Roman Emperor. Tannhäuser composed brilliant courtly love poems in the style of the Provençal Troubadours, whom we considered at length in a previous post. daz prüeve ich ûf der heide. wer sach ie sô schoenen plân? den truog ich mit tschoie zuo den frowen an dem tanze. welle ieman werden hôhgemuot, der hebe sich ûf die schanze! so the heath’s informed me. of the blossoms fairly made. Who has seen so fine a glade? and if a man should seek delight, he too should seize this chance! It’s interesting as a native English speaker to read Tannhäuser, because his archaic German, suffused as it is with Romance loan words, at times resembles English as much as contemporary German. Sometime in the fifteenth century, Tannhäuser became a figure of legend. He is said to have traveled to the Mountain of Venus, where he remained enthralled in the arms of the goddess for a time. The noble German knight Tannhäuser traveled through many lands, falling at last into Lady Venus’ Mountain, where he beheld great wonders. Though he dwelt there for a while, happy and in good spirits, his conscience drove him at last to return to the world, and he sought leave. But Lady Venus sought by every means to shake his resolve, offering up her playmates to be his wife. She implored him to think of her red lips, which smiled upon him always. Tannhäuser answered that no wife could save him from burning in hell forever. He was indifferent to her red mouth and could remain no longer, for his life had become a pestilence. And so the she-devil, to hold fast to his love (Minne), locked him in his chamber. But the noble knight castigated her harshly, and he called upon the Heavenly Virgin to part them, and so it was done. Tannhäuser said “Had I but one year to live upon this earth, I should have offered such remorse and repentance that God should have shown mercy.” And full of sorrow at his damning by the Pope, he went forth from the city and returned to the diabolical Mountain, eternally and forevermore to dwell within. Lady Venus welcomed him back as though welcoming a long-parted lover. Three days later, the Pope’s staff burst into flower. He sent embassies to every land to find where noble Tannhäuser had gone, but it was too late. Tannhäuser remained in the Mountain, having chosen his favorite companion, and there he must dwell until the Last Days, when perhaps God would show him another way. This extremely interesting legend illustrates a central tension at the heart of German literature in the High Middle Ages – the conflict between the underlying Germano-Celtic worldview that was thousands of years old, and the more recent overlay of a Christian vision of sin and salvation. The profound influence of Celto-Germanic myths and legends is visible throughout Europe in the Middle Ages, and the Tannhäuser legend includes its quintessential episode: a hero is sequestered in the castle or realm of an enchantress or fairy. In these accounts, the hero often attempts to return to the mundane world, only to learn that time has passed him by. One glorious example of this motif is the early Irish story of Oisin, a great warrior who traveled to the timeless realm of Tir-na-nog with the beautiful Níamh Chinn Óir of the immortal folk, the Tuatha Dé Danann. Then she sighed gently, ‘It grows late. As Yeats’ melancholy poem illustrates, the Celtic heart was deeply ambivalent about the lure of the timeless realm, which was both a flight into eternity and a retreat from mortality. In most versions of the story, the hero goes for a while, but his mortal heart calls at last for return to the field of time. Frequently, upon his return, the centuries of his absence catch up with him, and he falls to dust. 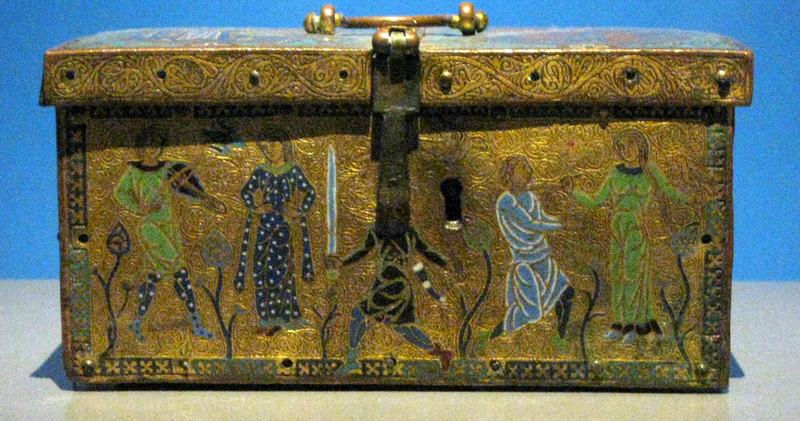 This motif is frequently found in Arthurian romance, in which a questing knight may aid a queen or maiden under siege or locked in an enchanted castle. For example, in von Eschenbach’s Parzial, the hero’s father Gahmuret comes to the aid of the besieged Moorish queen Belacane in the fantastic land of Zazamanc. He lives with her for a while, until he is called back to battle, where he is killed. Once Christian morality is in place in Europe, the Celtic psychological predicament takes on a diabolical aspect, for treating with immortals can only be seen as a heathen indulgence. The Celt was untroubled by the sexual lushness of the timeless paradise, and this fit well with the themes of adultery so often found in Arthurian romance, such as the extremely popular adultery of Guinevere and Lancelot. Gottfried von Strassburg, following the vision of the Troubadours, elevates adulterous love to the highest position in the scale of values in his Tristan, literally making an altar of the lovers’ bed. This only added to the consternation felt by Christianized authors, who associated the sensual license extolled by the Troubadours and Minnesängers with heathenism. In this context, it makes sense that a well-known Minnesinger like Tannhäuser, singing courtly songs of love in the Troubadour style, featured in a moral legend that rejects the old Celtic vision. This post has already grown long so I don’t want to spend much time on Wagner’s use of the material, other than to observe that he zeroed in on this conflict between pagan and Christian morality and exaggerated it to brilliant effect, even if the opera is not numbered among his greatest works. Wagner added yet another level to the problem by musically associating the libertine spirit of love with modernism and the avant-garde. The scenes he set in Venusberg are scored in a thoroughly modern fashion, anticipating his development of “continuous music” which rejects the recitative/aria structure of conventional opera. The scenes set in the Wartburg Court, where Tannhäuser is harshly criticized by his fellows for his sinful ways, use conventional forms, including classical arias and duets.